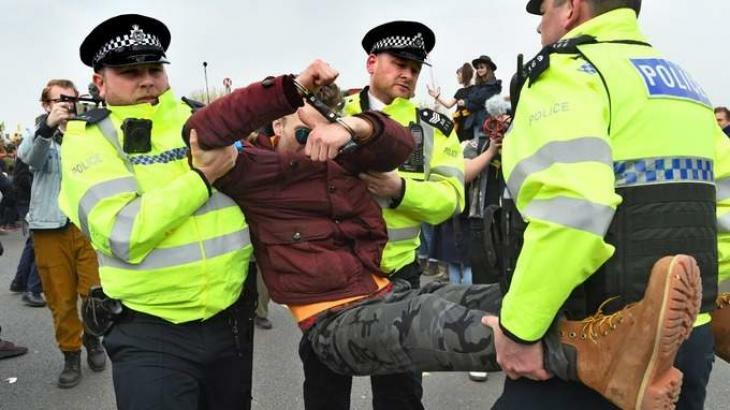 MOSCOW (UrduPoint News / Sputnik - 17th April, 2019) The number of protesters against environmental pollution arrested by the UK Metropolitan Police Service in a rally, which has been ongoing in central London since Monday, has increased to 290, the police said late on Tuesday. Earlier that day, the police said that 209 arrests were made as thousands of protesters blocked traffic on several highways in London during rush hours on Monday and Tuesday. On Monday, protesters damaged the Royal Dutch Shell's headquarters building. The protesters plan to continue rallies round the clock for the next two weeks, and police have mobilized significant resources to prevent incidents. The protest was organized by the UK Extinction Rebellion environmental organization, which previously set up a similar action during a UK parliament session in early April, during which 12 people were detained. The activists demand that the government addresses what they describe as an "ecological emergency."